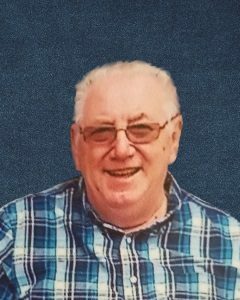 Ralph Plath, age 75, of Hutchinson, Minnesota, passed away Tuesday, October 30, 2018, at the St. Cloud Hospital, in St. Cloud, Minnesota. Graveside service will be held on Sunday, November 4, 2018, at 3:00 P.M. at Peace Lutheran Cemetery in Hutchinson, Minnesota. Ralph Arnold Plath was born on November 19, 1942, in Hutchinson, Minnesota. He was the son of Rueben and Lida (Plamann) Plath. Ralph was baptized as an infant, on December 20, 1942, and was confirmed in his faith, on June 19, 1957, at Immanuel Evangelical Lutheran Church in Acoma Township. He received his early education at Immanuel Lutheran School and was a graduate of Hutchinson High School Class of 1961. On February 15, 1964, Ralph was united in marriage to Arlys Hagen at Grace Lutheran Church in Hutchinson. This marriage was blessed with three children, Terry, Tom and Amy. Ralph and Arlys resided in Hutchinson. They shared 54 years of marriage. After High School, Ralph worked several years at the Farmers Elevator Association in Hutchinson. He was later employed with Hutchinson Technology Inc. in Hutchinson and more recently, Miller Manufacturing in Glencoe, Minnesota. Ralph was a member of Peace Lutheran Church in Hutchinson. Ralph was an excellent carpenter; he could be counted on to fix anything broken. He enjoyed working with tools and staying busy on various projects. Ralph enjoyed playing cards, listening to classic country and old-time music, ice fishing, and deer hunting trips to Orr, Minnesota. He especially enjoyed spending time with his wife, Arlys, grandchildren, family, and friends. Ralph suffered a stroke on October 21, 2018, and passed away on Tuesday, October 30, 2018, at the St. Cloud Hospital in St. Cloud, Minnesota, at the age of 75 years. Within hours of Ralph being called home, his family was blessed with the birth of his Great-Grandchild, Colton. He will be greatly missed by all. Many nieces, nephews, and friends. Ralph is preceded in death by his Parents, Rueben and Lida Plath, Brother, Dale Plath and Grandson, Derek Plath.